1. Describe yourself – who are you? I’m Laur and I’m Filipino-Chinese and quite proud of that! I moved to the U.S. after graduating high school from the Philippines and attended college at UC Berkeley as a History of Art major. I’ve been drawing since I was four yrs. old and I love various kinds of entertainment including books, movies, animation, TV shows. I’m very fortunate to have a creative outlet with comics. 2. How did you get started with drawing manga? I started in high school drawing stories my friends I would make up. We made our own original characters to interact with our favorite characters from anime shows. I liked drawing and making my friends laugh and smile so I just kept doing it. I started working on my own stories more in college. It took a while but I’m finally able to self-publish my first book this year. 3. Was there an artist or a story which inspired you? There’s so many! But I remember really being stunned by Glen Keane’s work with Ariel on The Little Mermaid. The first time I watched that movie transformed the way I thought about art and storytelling. 4. What is it about manga that you like the most? Initially, it was about the kinds of stories I found in manga compared with superhero comics or Archie comics – the only kinds of sequential art I was exposed to when I was young. Protagonists would be younger and many of them could be girls. It was definitely more accessible, with much more expressive characters and interesting storylines. Then, I started appreciating it for the beautiful effects that could be achieved with just black and white. The panel structures were unique and for me, made much more use of the entire page as a canvass to tell the story. Finally, because stories can be decompressed to have high action and slower, quieter moments, you get a real sense of the characters and the world they live in. 5. Did you ever go to a school to learn how to draw manga? * I should probably clarify this point. I’m not against going to school for sequential art per se. It’s just that for me, I didn’t feel the need to go to school for “manga” since I felt I already have enough skills to start making it and as always, I am broke. 6. What kind of environment is the place where you work on your manga? (See above photo.) It’s just my bedroom with a designated office space. 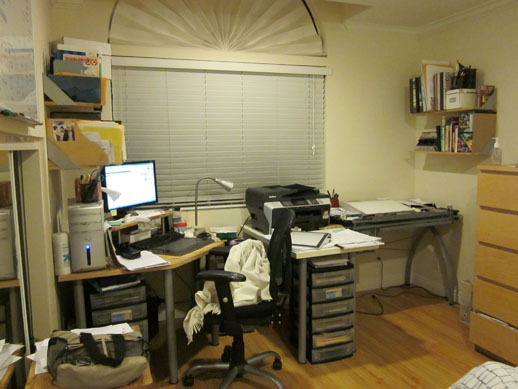 The area is made up of a computer desk, a middle desk where my printer/scanner sits, an art table where my lightbox and wall shelves with my favorite comics on it. Oh, and I have a few whiteboards to keep tab of deadlines and notes. 7. How long do you think it takes to complete an entire manga book? I’m not really sure. For me, working on Polterguys has taken me a little bit over a year and that’s just the actual writing and drawing. The idea came way back in 2007 and I’ve been trying to develop the story ever since. If I remember Tokyopop artists used to complete 200- something page books in about six months (I could be wrong!) but since I’m doing everything myself (writing, marketing, editing, printing etc.) I can give myself a little slack. 8. What advice would you give to people who want to draw manga? Be curious and persistent. Never stop learning. Devour as much information as you can about drawing, comics and all the skills you need to be great at both. Draw from life – not just manga books. The more you do this, the sooner you’ll develop a unique style that will set you apart. You will always run into people who will be better than you and that’s okay, learn from them. Focus on your own development, be patient and enjoy the journey. 9. Do you consider drawing manga fun and what makes it fun? It is a lot of work and sometimes very tedious to draw (backgrounds, especially) but at the end of the day, you created a page that came from your brain and was translated through your hand. There is magic to that. There is also the opportunity to connect with people who appreciate your story and the friendships you can make from that. Comics is a fun form of art. The community is generally very creator-friendly and helpful to aspiring artists. 10. What challenges do you face when creating a manga? Writing a good story is a big challenge. Polterguys took three rewrites to get right. This means I overhauled two completed different versions of the story and that was paintful because it was a lot of work. But I do it because I prioritize story above all. Even if a comic has gorgeous art, it means nothing to me if the story falls flat. When you’re starting out, you don’t have to be as hard on yourself but if you care, you’ll give it your all.